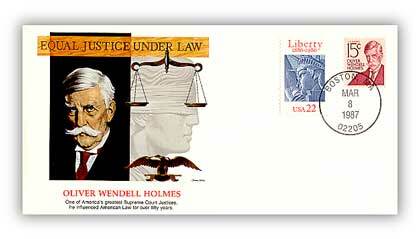 Birth of Oliver Wendell Holmes, Jr.
U.S. #1288 was issued on Holmes’ 127th birthday. 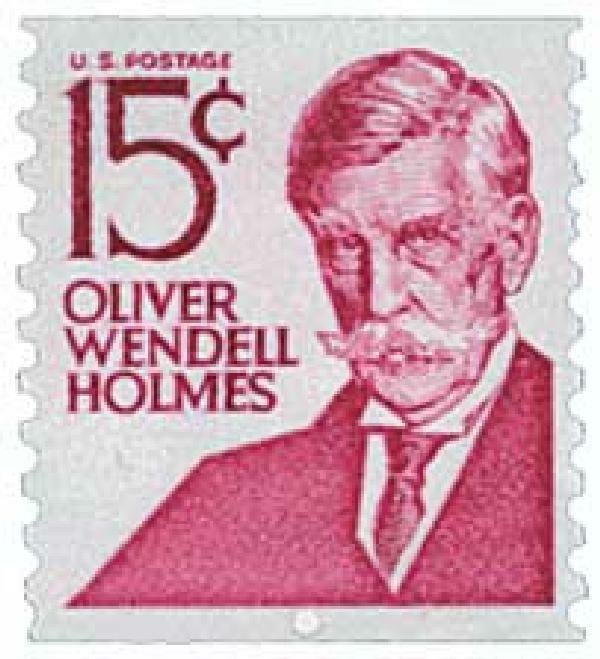 Oliver Wendell Holmes, Jr. was born on March 8, 1841, in Boston, Massachusetts. Holmes was a descendant of the powerful Quincy political family and the son of Oliver Wendell Holmes, Sr., a prominent writer and physician. While Oliver Jr. and his mother Amelia supported the abolitionist movement, Oliver Sr. was interested only in preserving the nation. His attitude changed after South Carolina seceded, when the senior Holmes became a firm Unionist. U.S. #1305E – A coil version of the above stamp. As his father began publishing patriotic pieces supporting the Union cause, the younger Holmes graduated from Harvard University in 1861. He then enlisted and was awarded a commission as a first lieutenant in the 20th Regiment of the Massachusetts Volunteer Infantry. 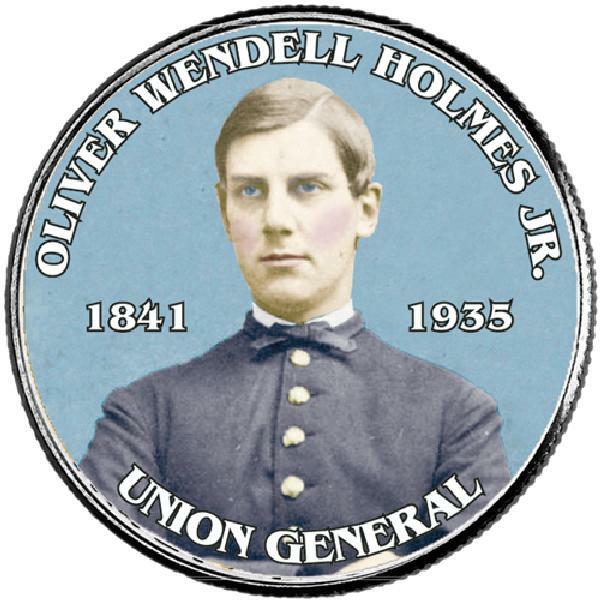 The officers of the newly formed 20th Massachusetts Volunteer Infantry were mostly Holmes’ classmates and the group quickly became known as the “Harvard Regiment.” Oliver Wendell Holmes, Jr.’s first service in battle was at Ball’s Bluff during October 1861, where nearly half the Union’s 1,700 troops were killed or wounded. Holmes was one of the casualties, suffering a serious shot in the chest. After a lengthy recuperation, he rejoined his regiment in time to witness the loss of several comrades killed in the Battle of Fair Oaks in June 1862. Item #MCNS4010 – Commemorative coin honoring Holmes’ Civil War service. Having attained the rank of captain, Holmes was wounded again during the Battle of Antietam. Holmes was shot in the neck while retreating during the one-day battle, which was the bloodiest in American history with 23,000 casualties. Telegraph wires were jammed the evening of September 17, 1862, as newspaper correspondents filed stories of the day’s horrendous events and comrades alerted families of the fate of fallen soldiers. 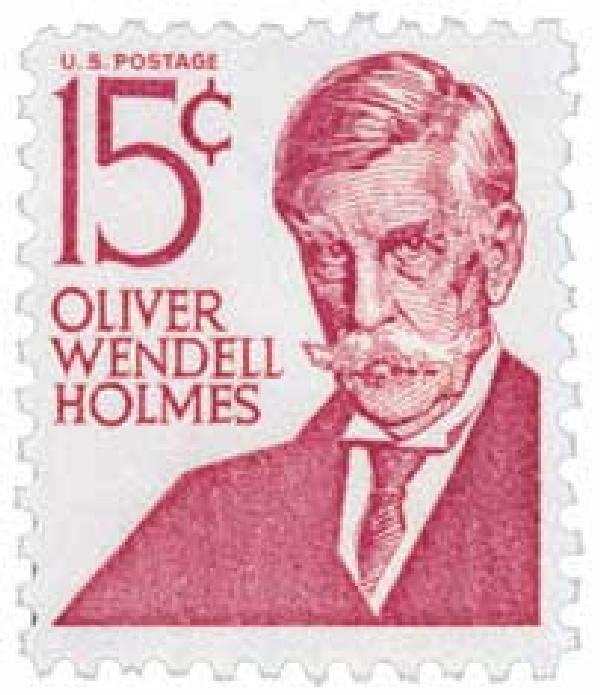 One of the telegraphs was sent to Oliver Wendell Holmes, Sr., in Boston. “Capt. Holmes wounded, shot through the neck. Thought not mortal at Keedysville.” A distinguished surgeon, the elder Holmes knew a shot to the neck was more likely lethal. He immediately boarded a southbound train in search of his son. During his journey, Holmes met a soldier that “mentioned incidentally having heard a story that… Wendell was killed.” Determined to find his son, Holmes pressed on and found him 11 days later. Holmes not only recovered, but returned to service and was wounded a third time in May of 1863. Item #81849 – Commemorative cover marking Holmes’146th birthday. After the war Holmes attended Harvard Law School, graduated in 1866 and passed the bar the following year. He quickly began working as a lawyer while also writing essays for law journals. Holmes served as editor of the American Law Review and returned to Harvard to lecture. Holmes joined the Massachusetts Supreme Court in 1883 and was made its chief justice in 1889. He would only hold that position for two years before he was called on for a higher position. In August 1902, President Theodore Roosevelt named Holmes to a seat on the U.S. Supreme Court to replace the retired Horace Gray. Senator Henry Cabot Lodge reportedly recommended Holmes, though Roosevelt had also admired Holmes’ speech, “Soldier’s Faith.” Some historians consider Holmes’ appointment one of the few in U.S. Supreme Court history not motivated by partisanship or politics, but solely on the nominee’s contribution to law. 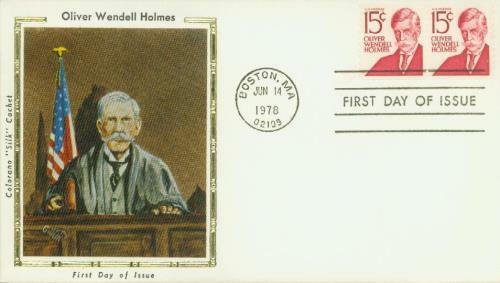 U.S. #1305E FDC – 1978 Holmes Silk Cachet First Day Cover. Click here for a collection of Holmes’ quotes. This entry was posted in March 2017, This Day in History. Bookmark the permalink. 8 Responses to "This Day in History… March 8, 1841"
Wow The article is very interesting story about Oliver Wendell Holmes, Jr.
Holmes was clearly one of the wisest Supreme Court justices that our nation has ever had. It would be wonderful if more of them had his philosophy of jurisprudence and his wisdom. Will we ever see another like him? We have had and do have some excellent ones; I pray that we may see more in my lifetime! Thank you for the history lesson. From your article Captain was a true patriot. Very interesting life story. Did not know about his civil war service. 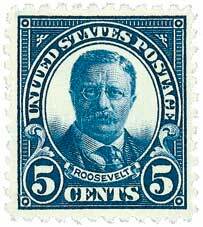 I’ve always liked this stamp and now have a deeper appreciation for the man. Thank you Mystic! Can’t think of a better background for a Supreme Court Justice than a wounded vet. What a great man who served his country well! We need more moderate judges like him on the Supreme Court; moderates look at the Constitution more objectively. The best way to keep the Supreme Court above the political field is to have moderate judges, not conservatives and liberals!